If you have tried online slots before you turned to play poker online you will be surprised by the betting system in poker. In order to learn How To Play Roulette you should study more than 10 bets, while in poker theere are 5. There are also five betting options for players in the online casino poker games. They include other choices than exist in roulette game: bet, call, check, fold and raise. It is very important to understand the betting mechanism in every round of poker game because these are the main poker betting rule in all game variations. 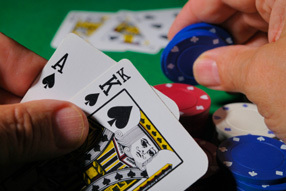 This option is offered only to the player who is the first to contribute into the pot in the particular betting round. In case the player has already bet the next one can only call, fold or raise. The bet option is also called opening. Calling means that the player is to match the amount of the bet made by the previous player. For example, if someone who acted before you has raised to $150 you are to call the same number of chips in order to stay in the hand. If not call the player can raise the bet (or reraise the previous raise) or fold and quit the hand. According to the poker betting rule the player can raise the bet only if the pot is already opened. Raising means that you call the previous bet and moreover add to the betting amount and force the other players to call more in order to continue. If you raise after the raise it is called reraising. The player has the option to check only if the pot has not been opened yet in the particular round or the previous bettor has chosen to check. In case the player before you has bet this option is not longer available. Every player always has the option to fold which means to forfeit the cards and stop competing for the pot no matter the previous action or the betting order.